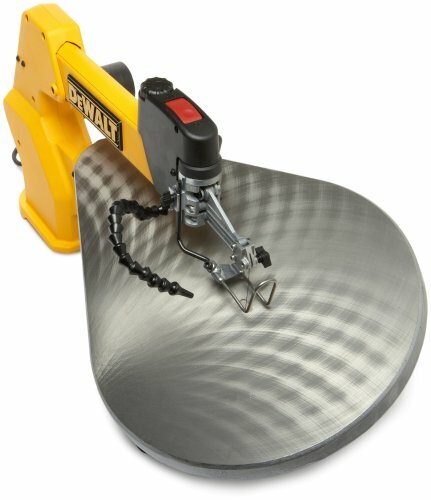 So what is the best scroll saw on the market today? Like all good power tools the choice is long and wide. 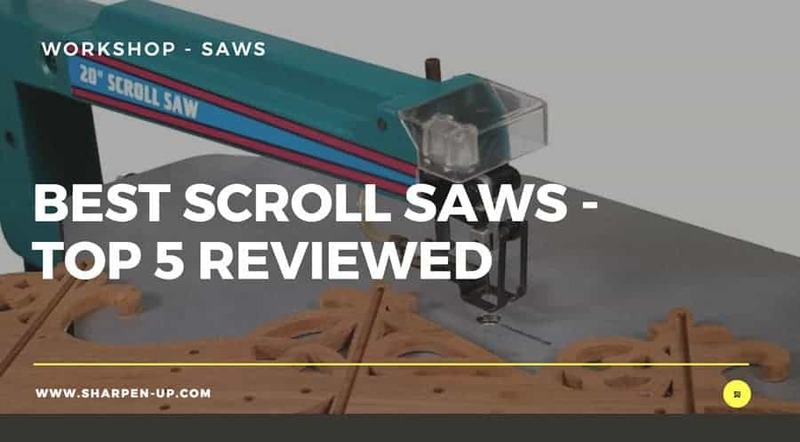 To help you in your search we have reviewed 5 of the top rated scroll saws currently available. For our selection at a glance just turn to the table below. For an in depth scroll saw buyer’s guide and full reviews of each of our selection – keep on reading. 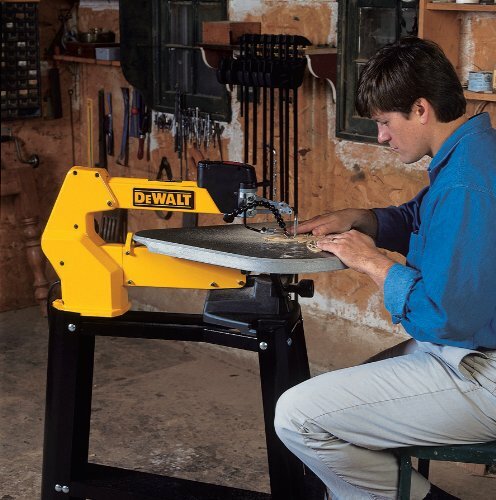 Our top pick scroll saw is the Dewalt DW788. The tool balances top-notch features with a premium build quality all in one very satisfying package. 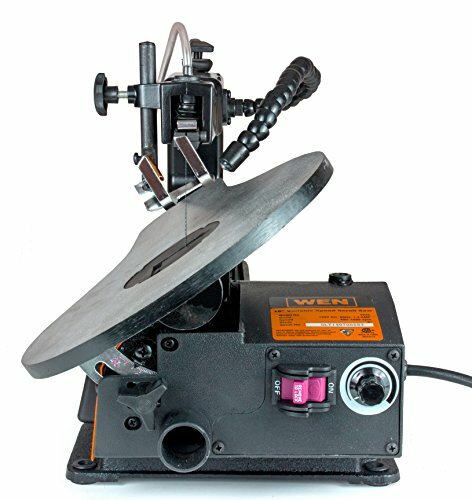 Furthermore, the consistent accuracy on precision cuts that you can get with the DW788 make it a go to tool for both beginner and semi-pro woodsmiths alike. 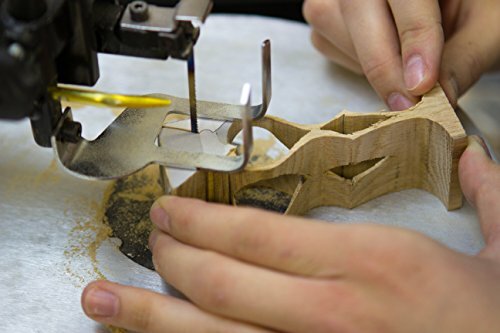 If you have read through our scroll saw buyer’s guide, you will actually see that most of what we have advised you should look out for when purchasing a scroll saw is clear and present in the Dewalt DW788. First off, the throat size is a very pleasing 20 inches. Anything smaller and you will be restricted in the types of projects you can do. Conversely, buying a 30 inch model can sometimes be a bit over kill. We recommend anything above 20 inches as a really good starting point. Moving on to the variable speed functionality. Here the Dewalt really shines. The DW788 has an electronic variable-speed control that is quick and easy to operate, (a big plus when in the middle of a job). The range is exactly what you’d expect from a tool of this calibre, with 400 to 1,750 strokes per minute at your disposal. Dewalt have packed in an adequate and reliable motor, with 1.3 amps chugging away under the hood. This delivers a variable stroke length between 3/4 inch and up to 2 inches deep. We mentioned the blade rocker arm in the guide above. Here Dewalt take a rather unique approach on the design of this. The DW788 utilises a double parallel-link arm system in a manner that they claim both increases accuracy while reducing vibration. 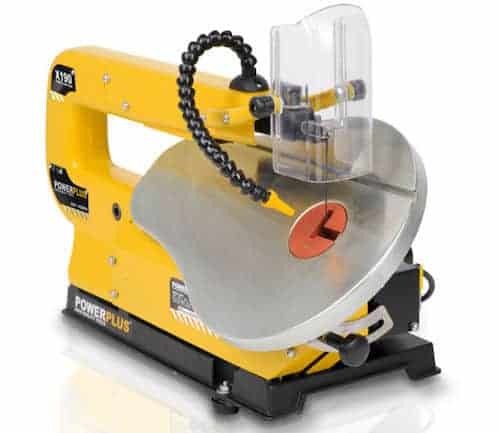 The innovative arm design helps to keep the saw’s blade perpendicular to the material you are working on, which in turn enables greater control, while reducing the chance of over or under cutting. The controls on the Dewalt have been carefully thought out from an ergonomic perspective. Everything you need to access is right up there on the front of the unit, on the upper arm. The scroll saw on-off switch, the variable speed control, and the blade-tensioning lever can all be accessed with a flick of the finger. Furthermore, we had a whole section on dust recovery system in the buyer’s guide. The Dewalt DW788 has a flexible dust blower (located on the upper arm) that can be easily controlled to ensure your work surface is kept clear of debris that could ruin your cut. Blade changes are a big part of working with a scroll saw. To be able to conduct these with speed and efficiency will save you a lot of time and frustration. Thankfully the manufacturers have come up trumps here too. The DEWALT DW788 features the company’s exclusive tool-free blade clamps that allow you to complete blade changes in mere seconds. The arm has also been designed to lift with ease, making it simple to thread the blade through your working materials when its time to create those inside cuts. The Dewalt scroll saw ships with an oversized cast-iron table that delivers exactly the right kind of stability you need. Furthermore, for increased versatility the table bevels 45 degrees both left and right. That sturdiness can be felt throughout the entire tool, and while it does weigh in at 56 pounds, for the majority of wood workers, this is still small enough to move around the shop easily. To top it all off, and yet another reason the Dewalt received our top pick best scroll saw, when you buy this tool the company throws in an extremely competitive warranty package. This includes a three-year limited warranty, a one-year free service contract, and a 90-day money-back guarantee. 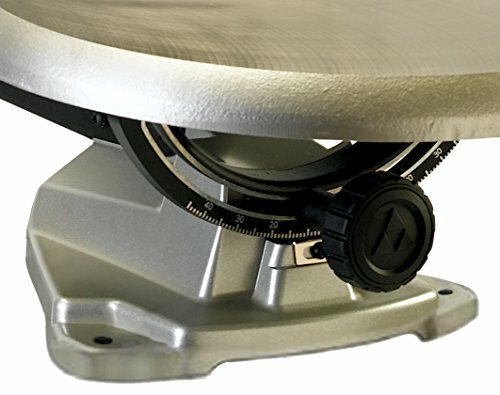 Unique double parallel-link arm design – a system that reduces vibration and noise for greater control and accuracy. Convenient controls across the board: On-off switch, blade-tensioning lever and variable speed all easily operated from the front upper arm. There’s no denying the fact that the Dewalt DW788 is more expensive than many other scroll saws on the market. The quality comes at a cost that may price some people out. 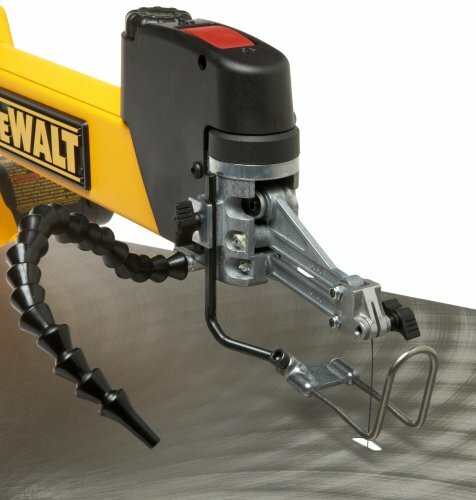 The Dewalt DW788 is a formidable piece of equipment. Packed with top features, some innovative design additions and overall high performance, this is a product hard to beat. 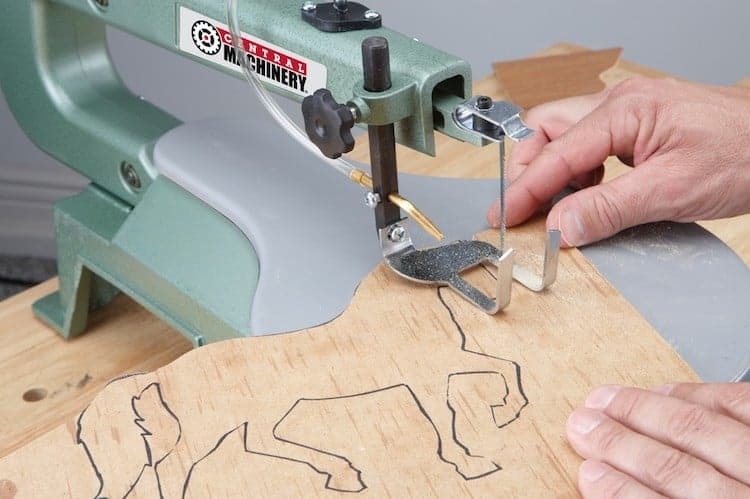 In our opinion the best scroll saw on the market today. Porter-Cable are a brand that need little introduction. 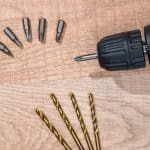 The company has a great reputation in the world of power tools, and their products have featured a number of times in our best of review articles. (Related Posts: Check here for our review of Porter-cable benchtop jointer). Keeping up the good work, the PCB375SS has a number of quality features making it a worthwhile addition to our top 5 scroll saw review list. Under the hood the PCB packs a 1.6 Amp ball bearing induction motor, capable of delivering variable speeds of 500~1500 spms. While the eagle-eyed among you will notice that the variable speed falls short of our top pick Dewalt, this is still a good range for such a competitively priced tool. Throat size is also shorter than the Dewalt. At 18 inches this could be a deal breaker for some. However, for beginner woodworkers (depending on your long term project plans), this could be more than adequate. The range of cutting height is good however. The blade can cut from 2-1/4 inches and 1-1/4 inches (45 degrees both left and right) with a maximum cutting height of 2-1/4 inches. Staying with important dimensions for a moment, the tool also features a good-sized aluminium dual tilting table, (12-5/8 inches x 20 inches) that is able to tilt 45 degrees left and 15 degrees right. Control and versatility really are the go here, and it is something that the Porter-Cable does very well indeed. Like the Dewalt, the controls are designed for easy access, with the on / off switch, variable speed select and cam action blade tension adjustment all located on the front end of the tool. For fast and efficient blade changes the Porter-Cable features an upfront tool-less blade holder. Woodworkers, no matter their experience will be able to easily change their scroll saw cutting blades for the job in hand. Finally, the overall build quality is definitely on the reassuring side. The die cast aluminum frame is certainly built to last, with the large cast iron base sturdy enough to keep vibrations down and the saw held fast as you work. If your workshop is a bit dim in the illumination department, the manufacturers have even included an LED work light. Last but by no means least, Porter–Cable include a three year limited warranty, with one-year free service. The scroll saw also ships with a 90-day money-back guarantee. 3 year limited warranty, one year free service and 90 day money back guarantee with every saw sold. Overall, the Porter Cable 18 inch variable speed scroll saw is a top-notch piece of kit for the money. Perfect for beginners with its current specs, it comes highly recommended. For those looking for greater power and throat size the Dewalt is the way to go however. The Delta Power Tools 40-694 Variable Speed Scroll Saw is right up there with Dewalt when it comes to specifications. The 20 inch throat size, and 400 – 1,750 spms makes it a direct competitor in many ways. As to is the fact the tool has obviously been designed with the professional and advanced woodworker in mind. This is a scroll saw that would not look out of place in a commercial workshop. It really does seem as if the two companies got together to discuss what the customer wants in the way of power and range. Under the hood the Delta 40-694 features a 1.3 amp motor. 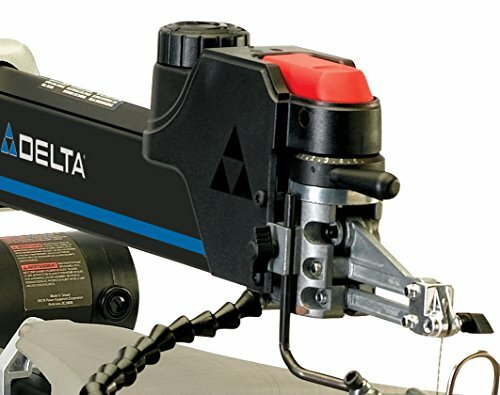 To accompany that 20-inch cutting capacity the Delta also has a ¾ inch stroke length. Table size is good too. Large enough to accommodate all manner of work pieces, the 16 inch x 24 inch surface is stable enough to minimise vibrations during operation. The specs are also rather satisfying when it comes to the units cutting capacities: 1⅝ inches at 45 degrees and 2⅛ inches at 90 degrees. Not to be outdone, Delta have also incorporated a Dual Parallel Link Arm Design to help minimise vibrations around the cutting area. This enables greater control for more intricate work. In the words of the manufacturer, “every cut is surgically accurate”. They’ll be little in the way of overcutting or undercutting with this tool, (so they say). Like the Dewalt, the upper arm on the Delta Power Tools lifts and locks into the raised position when you’re changing its blade, (or adjusting the blade position in order to carry out fret work. Tool-less blade changes are part of the package of course. Via a special clamp you can fix and release your blades within seconds. Like the Dewalt, the Delta Power tools 40-694 is aimed for the more experienced woodsmith. Beginners may be priced out of the game. 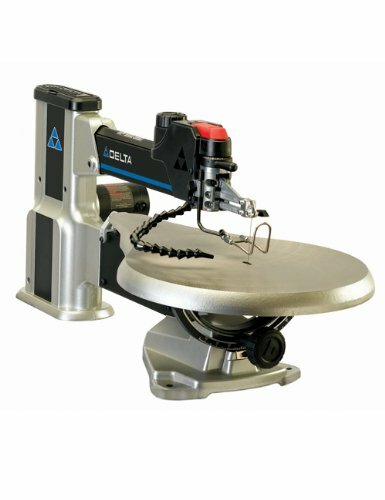 The Delta Power Tools 40-694 is an excellent scroll saw with an array of features that will please even the most cynical of woodsmiths. While it doesn’t quite reach the heady heights of our top pick Dewalt, the Delta still makes for a very reliable choice. Highly recommended. 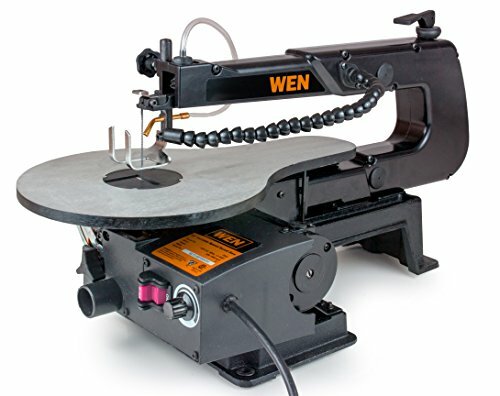 The WEN 3920 is a scroll saw with smaller capacity than the others in our top 5 list, with a throat size of 16 inches. The 1.2 amp motor does power a variable speed system, with the WEN capable of ranges between 400 to 1600 strokes per minute. Ergonomically the 3920 is nice and easy to pick up and use. That aforementioned variable speed operation is adjusted using a speed knob on the front of the tool. The blade tension-release switch is located conveniently on to the top. 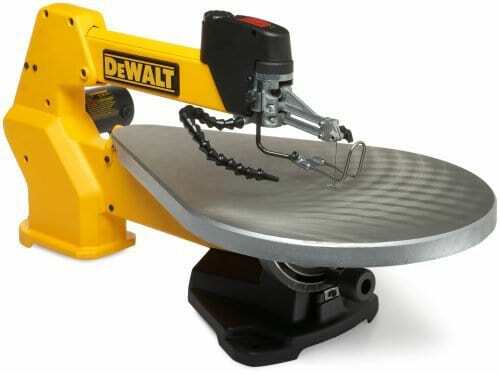 Due to the smaller throat size, the work table is also reduced when compared to the likes of the Dewalt and Delta. Measuring in at 16-by-10-inches, the durable table is well made and bevels up to 45 degrees to the left. WEN state that wood up to 1.9 inches thick can be worked with. The 3920 is also capable of a 9/16 inch stroke with both pinned and pinless blades. The saw has a cast iron construction providing the robustness you need along with the reduced vibration required for intricate work. 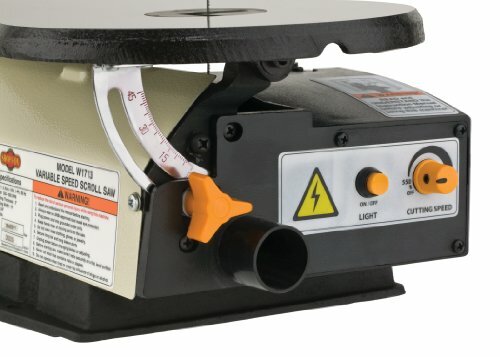 The WEN 3920 scroll saw also has boltholes that can be used to firmly fix the unit to a tabletop or work surface. There is also an air pump built in to clear saw dust from the cutting area as you work. This, along with the 1.5 inch dust port really do help minimise unwanted debris getting in the way. A clamp is provided that can be used to secure your materials ready for the cut. A flexible work light is also a nice addition that can be manipulated to illuminate the work area. To top it all off, WEN back their scroll saw with a 2-year warranty, telephone support and a nationwide network of skilled service technicians. Cast iron construction for reduced vibration. 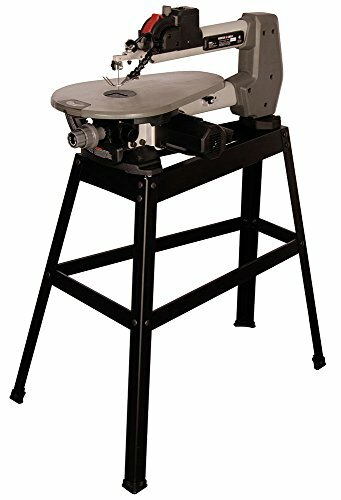 The WEN 3920 16 inch variable speed scroll saw is a great budget buy for the beginner. 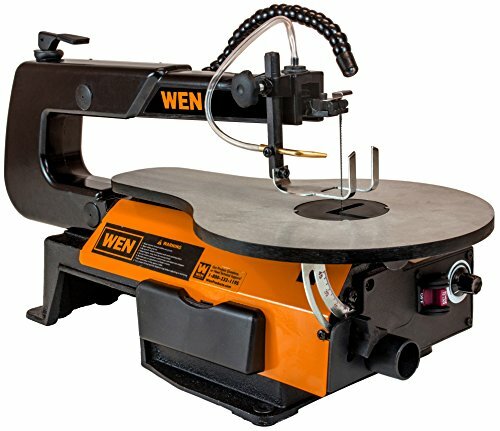 Lower priced than the other saws in our top 5 the WEN makes for an easy entry into the world of the scroll saw. However, depending on your projects, you could end up out growing the tool quite quickly. Consider your long term woodworking plans before you buy. Much like the WEN reviewed above, the Shop Fox W1713 is pitched at the beginner user, providing some great features at an entry level price. Variable speed control is there as you would expect. The range is an impressive 550 to 1650 spms on this 16 inch capacity machine. Under the hood the Shop Fox doesn’t quite match the WEN with the motor coming in at 1.2 amps. Similar features are abound however. The Shop Fox Scroll Saw has the gooseneck work light for illumination, a built in dust blower and dust port and a 45° tilt table for adjusting your materials for the cut. Plain or pin-end saw blades can be accommodated by the W1713. A real bonus is the fact these can be removed quickly and easily with the included adapters. Shop Fox ship the tool with a hold-down shoe (perfect for beginners) that will fix your materials into place as you work. Overall construction quality is good on the W1713. The manufacturers state that the robust design is intended to provide many years of trouble free service. Shop Fox have a good reputation in this area too. 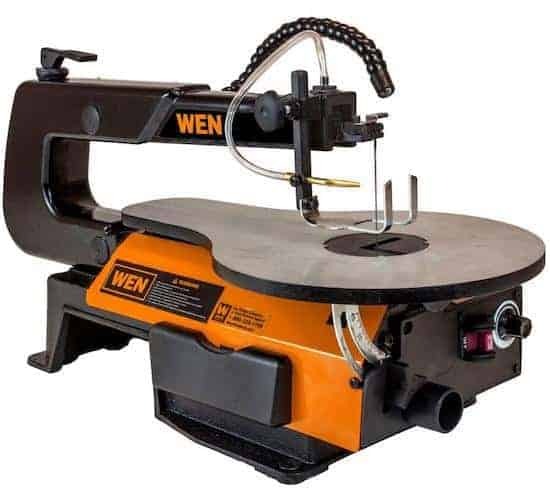 Their products have appeared in our top 5 lists for a number of categories now, (check reviews for their mini mill, track saw, mortise machine and benchtop jointer). The company’s close attention to detail; using quality components alongside a stringent quality control program have seen a consistent output of products that really are worthy of consideration. The Shop Fox W1713 is CSA certified and comes with a 2 year warranty. The Shop Fox W1713 is another well made tool to come from this brand. Good features and affordability make for a worthwhile purchase. As with the WEN however, consider your long-term woodworking plans before opting to buy. The best way to describe a scroll saw is to class it as a motorized coping saw. No power tool is better at cutting tight curves and intricate shapes with such a wide range of materials. This makes the scroll saw rather specific in its uses. Compared to the daddies of the workshop, (band saw we’re looking at you), the average scroll saw is actually pretty diminutive in size. There’s no fence or miter gauge and power is rather limited. 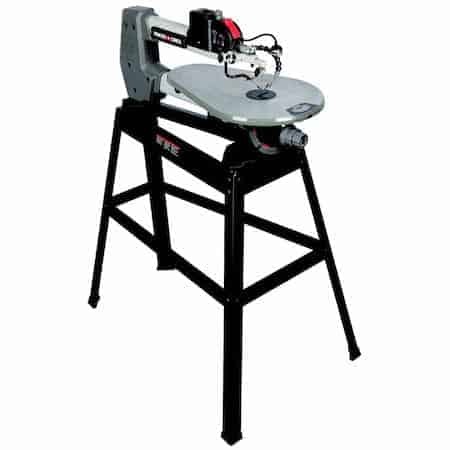 However, this makes the scroll saw perfect for the careful cutting work you will be using it for. Let’s take a closer look at the various benefits this handy tool has to offer. 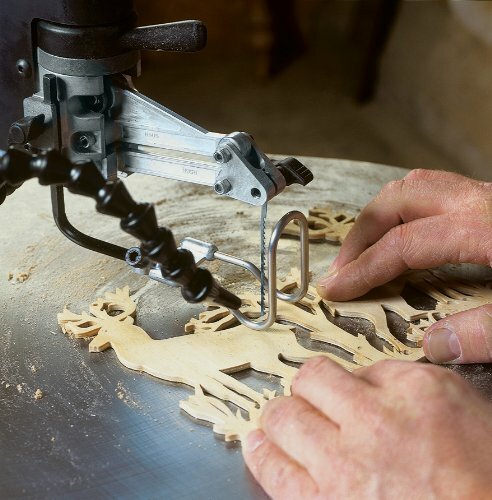 The scroll saw shines above other tools in your shop because it can saw curves tighter than any other motorised tool. It can also make completely enclosed internal cuts. The range of materials it can work on is also very good. Whether you’re sawing into thin veneer, or cutting circles into a thick piece of 2 inch lumber, your scroll saw will be up to the task. Similar to a portable sabre saw the scroll saw uses an up-and-down reciprocating action during the sawing process. Being smaller in size when compared to other shop tools, you will also find a use for a scroll saw for jobs your other machines are just a bit too big for. With a good saw you change your blade in less than 30 seconds. 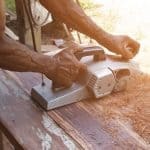 And with the correct blade in place, paring off thin slices of wood, cutting mortises or simply shaving out the waste in your dovetails is a simple and efficient job. 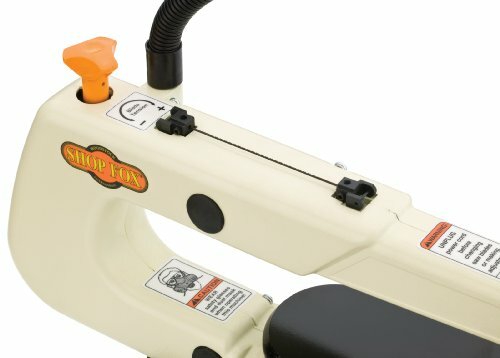 For those that make the jump and decide to add a scroll saw to their equipment list, the range of benefits is long. For many it becomes one of the most widely used tool in the shop. It is all well and good knowing that you wish to buy a scroll saw, the difficult part is knowing which to go for. With myriad brands and models available today, it is important to be informed. 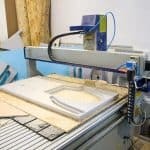 Here’s what you should be looking out for when you’re in the market for buying the best scroll saw. Throat size is one of the most important specifications you need to pay attention to. This will also be one of the main selling points as far as the manufacturers go. Normally included within the actual name of the product, you will see scroll saws labeled anything between 16 inches and 30-inches. For the uninitiated this measurement is describing the distance from the back of the blade to the very back “throat” of the saw. It is important to know this length because it has a direct impact on the size of materials you can cut. Whatever throat size your model of scroll saw has, gives you the ability to cut a piece of wood double that length. So quite simply, a large scroll saw with a 30-inch ‘throat’ will be able to cut a piece of wood 60 inches in length. 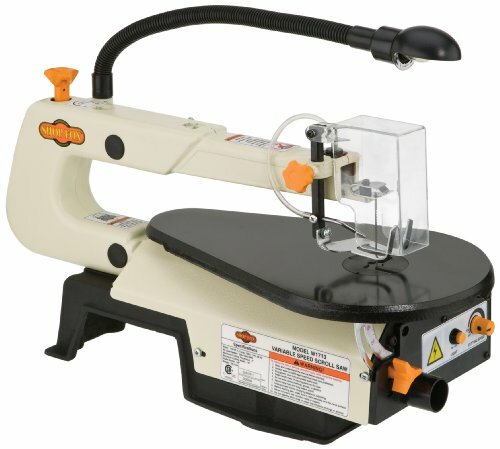 In all honesty, a 16-inch scroll saw will be very limited for most woodworkers and is only recommended for beginners. A good rule of thumb if you do not want to outgrow your scroll saw too quickly is to opt for anything above 20 inches. Essentially, a 30-inch scroll saw is the largest you can buy. While not necessary for everyone, the versatility of such a tool can make it a worthwhile buy over the long term. A variable speed motor is an important feature you should look out for. A good scroll saw variable-speed motor will generally go as low as 400 strokes per minute (spm). On the top end of the scale, you should opt for a motor that will take you right up to 1750 spms. 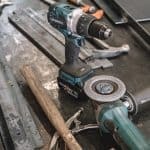 You’re going to need the slow speeds to accurately conduct fine work, and to cut through nonferrous metals and plastics. Higher speeds are best on wood when you are not sawing into tight spots. The variable speed system should be easy to operate, (normally via a dial) and on the very best scroll saws you will have a live indicator for blade speed spms. As mentioned above, the majority of scroll saws work via a reciprocating mechanism called a parallel-arm system. Two long arms form the heart of the system. These swing in a tandem seesawing action. As the arms pivot the blade moves up and down. It is important that these components are made from durable materials, and are fixed together in a way that will ensure long-term use. Here user reviews and industry comment are your go to friends. You do not want to buy a scroll saw where the moving parts seize within a year. Your scroll saw is nothing without good blades. However, to confuse matters for the beginner, there are a number of different blades you can buy. Reverse-tooth blades are interesting in that 3/4 of the teeth point downwards and cut through the wood from the top. The other 1/4 of the teeth point upwards, and clearly cut as the blade slices on the upstroke. The benefit means there is less sanding to do on the reverse side of the material. Again, the clue is the name. Skip-tooth blades are missing every other tooth. The reason woodworkers opt for this type of blade is because the cut is more aggressive. The missing teeth also pulls more saw dust from the slice. Wood burning is also reduced due to less friction. Double tooth blades have two teeth in the space where one would be on an ordinary blade. The cut is less aggressive on a double tooth blade, which amounts for better control. These are recommended for beginners as a result. Non reverse blades have full “toothage”, with all the teeth point downwards. All said and done, there is quite a bit to learn when it comes to scroll saw blades. One of the best ways to discover what does what, is to purchase a few blades with your saw and experiment. All scroll saws can accommodate the various blades available. The important aspect to look at is how easy they are to change. Blade Change Efficiency (Tools or no tools). Following on from above, you should ascertain exactly how you go about changing blades when you choose to buy a scroll saw. A fiddly, inefficient system will cause frustration and time delays. Some scroll saws will require tools to change the blade. And while these are generally supplied with the product, if you are working on a project with various types of cut requires, changing the blade back and forth will eat into your shop time. For obvious reasons a tool-less blade change system is recommended. You should still ensure that the system has adequate safety to prevent any unintentional blade removal. However, a tool-less change will generally be faster and more efficient. One issue to bare in mind with tool-less changes is that the small mechanism that allows for fast blade changes do become worn. A top product will have more durable components in this regard; so again, user reviews are a good indication on how robust such parts are. 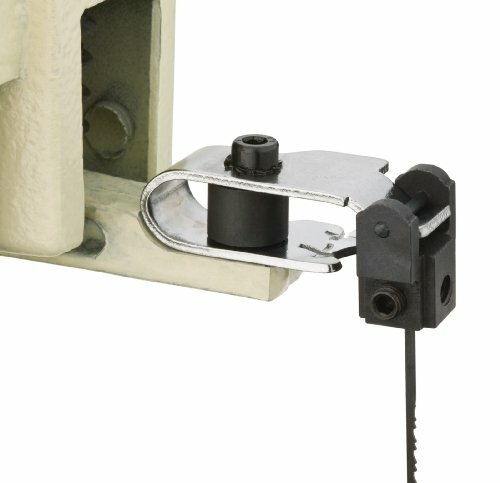 The blade tensioning system on your chosen scroll saw also needs to be up to scratch. Where some models will feature levers for adjustment, others will use cam-tensioning mechanisms. Knobs and screws will also be used to tighten the blade while in place. (Many smaller sized saws (16 inch models in other words) will house the tensioning lever / knob at the back rather than the head). As we described above, the blade rocker arm is the system that provides the saw with it reciprocal up and down sawing action. You will find some scroll saws feature one solid arm that goes from the front to the back when moving the blade. Some critics of this mechanism state that the motion is not smooth enough for making really delicate cuts. The fact is, most single arm designs are usually found on lower budget scroll saws. The double-armed system features two arms that work more like a cam. These are generally more stable and exert less vibration. They are recommended over the one armed system. While this should not be a deal breaker by any means; some scroll saws have greaseless bushings and bearings requiring little to no maintenance. Other designs require lubrication that needs to be added by the operator after a certain amount of use. As with any sawdust as you work will be an issue. The important factor is how the tool goes about reducing this. Some scroll saws have blow tubes while others feature compressors. Again, users reviews will help ascertain just how effective such features are in general use. If a blow tube is used, it is important that the tube is flexible and long enough for the dust collection apparatus to not be in your way as you work. 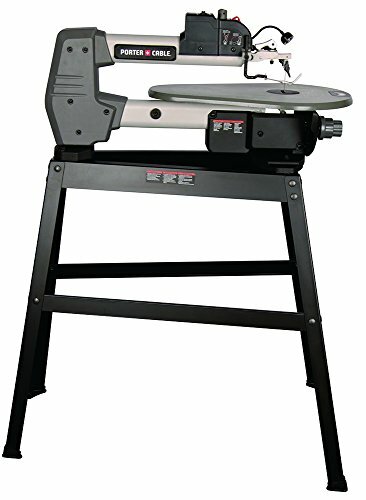 Another important variable you should consider when buying the best scroll saw is table dimensions and design. The table should also be made of hardwearing material that has a smooth surface to avoid friction as you work. You should look for aluminum or cast iron table construction if you can. 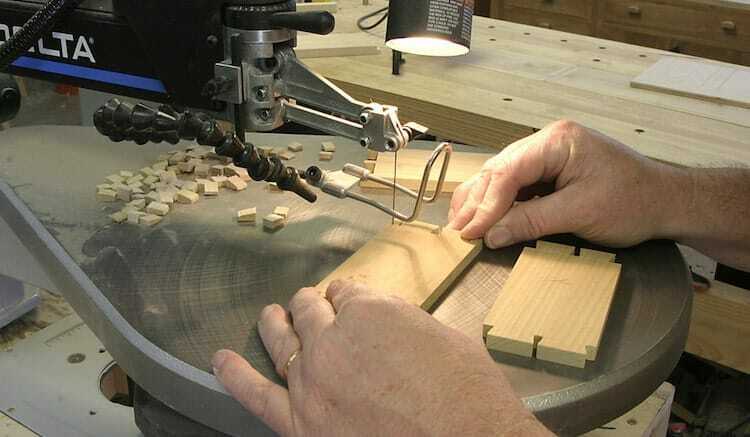 Your chosen scroll saw should have adequate means to firmly fix the material you are working on. This is normally done via what is called the hold down foot. You will want this to be adjustable and reliable, especially when starting out. (As you become more experienced you may not require the foot as it can be cumbersome and restrict your overall control). Again, this may not be a deal breaker. If you have a designated workbench ready and waiting for your scroll saw, you will not need a stand. 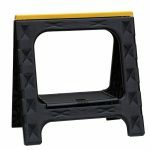 On the other hand, a stand may be a vital component that you need. Some saws will ship with a stand, others will not. It is important to know exactly what is included in your package, along with what you will need. As mentioned above, you will be using various types of blade with your scroll saw. When shopping for the best scroll saw a nice feature to have will be one that safely houses your blade ready when they need to be used. Finally, features such as a work light fitted into the system can be very handy indeed. Providing extra visibility when you might need it, the ability to flick a switch and have your material lit up ready for the cut is something you will come to appreciate.